A special Valentine's Day happy hour celebration will be held at the Aloft Hotel on Monday, February 14, from 5 to 7pm. Admission is free. Dallas (January, 15 2011) – Today Marks the Beginning (TMtB), a non-profit arts organization that uses art to impact public awareness of social issues, created a project called “LOVE” lesson, an arts competition that teaches students about the origin of St. Valentine’s Day, the tradition of giving Valentines and what a great peacemaker means when talking about “LOVE.” The lesson was taught to over 400 students at Irma Rangel Young Women’s Leadership School, L.L. 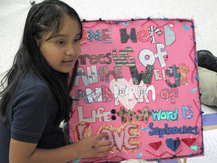 Hotchkiss Elementary and Parish Episcopal in which the students created artwork inspired by great peacemakers’ quotes about “Love.” TMtB will judge each piece of artwork and choose 10 winners from each school, which their art will be hung right before Valentine’s Day, from February 8 – 21, at Neiman Marcus in North Park Mall. The rest of the student’s artwork will be featured at the Aloft Hotel, sponsored by Ro2 Art and Today Marks the Beginning. Today Marks the Beginning, created in 2005, is a non-profit organization full of creative individuals who use art to bring public awareness of important social issues through a diverse range of projects. The organization strongly believes that art is a powerful vehicle for promoting issues of peace and social justice. Their work is guided by artistic expression, open dialogue, and creative solutions tied to a social purpose.